Monday Morning Cooking club is made up of six woman who have been cooking together every Monday morning since 2006. Their directive was to put together a cookbook to raise money for charity. It was then their mission to take it one step further, and to actually try to find the best recipes from the best cooks in Sydney's Jewish Community. "We wanted to share with the world our community's unusually strong, somewhat obsessive, connection with food". 1. Press FUNCTION button then select SLOW COOK, ensuring indicator light illuminates. 2. Turn TIME dial to 8 hours. 4. Heat oil in an oven proof casserole dish over a medium/high heat on the stove top for 1 minute. Add Osso Bucco and sear in batches on both sides until well browned. Remove from the dish. 5. Add the vegetables and garlic and fry until soft, adding more oil if necessary. Add the herbs, bay leaves and cloves. 6. Add the wine to the pan, and boil for 5 minutes. 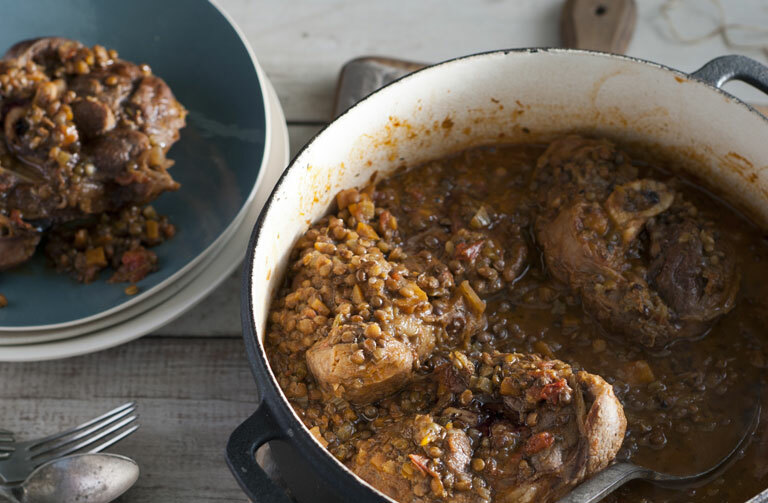 Add tomatoes, lentils and stock, stir, then return the Osso Bucco pieces to the pan. Push the Osso Bucco pieces and lentils into the liquid to ensure they are almost totally covered. 7. Cover with foil. When preheating has completed, place the casserole dish in the Smart Oven Pro for 8 hours or until meat is very tender and coming away from the bone. 8. Sprinkle with chopped parsley and serve. any reason why I cannot use the Fast Slow Pro for this dish? Hi Abe, The slow cook setting for lentils in the Fast Slow Pro, is 6 hours on high. Select this setting. It's the same setting & time required in the Smart Oven recipe. I have just experimenting with the slow cooking function. The oven seems to run pretty hot with the convection switched on during slow cooking. Is it OK to just turn it off? Or is it essential I leave it on? Hi Paul - when using the slow cook function the unit will use the convection component and this is necessary when using the slow cook function.